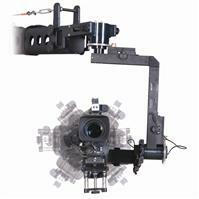 PRODUCT DETAILS It is upgraded remote head from normal L-Sharp remote head of Superman crane, which offers you a complete 360 degree roll movement. It helps operator create more artistic moves which normal head can not achieve. The control system provides variable speed control, reverse switch for pan, tilt and roll movement, and damp control for smooth starts and stops.